Ruimsig Informal Settlement is located on the West Rand and is part of the Greater Johannesburg Metropolitan area. The settlement also sits on the border of another municipality, Mogale City, and this duality often causes confusion with regard to the two cities’ responsibilities and leads to frustration on the part of the residents. The Informal Settlement covers an area of 5.2 hectors and is situated in the heart of a middle to upper class residential area. This was not the case when the first residents of the settlement lived on the land in the mid 1980’s. The area was predominantly farmland. In 1986 the farm was sold to a new owner who started charging rent to the farm workers. A few other families came to live on the land and they too were charged rent. In 1998 the Johannesburg Municipality bought the land. This was around the time when the area started shifting from a rural farmland setting to a more urban residential environment. This shift also brought more people to live in the settlement as job opportunities related to the building sector grew. According to a survey that was conducted by the Informal Settlement community and CORC, the number of households is 369. Basic services are limited and include 70 Ventilated Improved Pit (VIP) toilets, which the City services once a year. Some of the toilets are difficult for the truck to get to due to shack congestion and bad roads, so these toilets are not serviced at all. There are three standpipes that are each connected to three water tanks in three different locations of the settlement. Of these water outlets, one is not working. The settlement has no electricity. Residents of the settlement are tired of bad and unhealthy living conditions related to inadequate services and congestion. They have decided to help themselves. The residents are linked to a broad based national network of shack dwellers known as the Informal Settlement Network (ISN). This network has adopted the approaches of Shack Dwellers International (SDI), following the rituals of community-based savings; community led surveying, horizontal exchanges from one community to another and community-led development. Ruimsig Informal Settlement being part of the ISN was identified as one of the pilot project sites. The community identified the need to create a better layout for the settlement as one of its main priorities. With a better layout, issues of congestion and density can be addressed, safer areas for children to play can be created, a safer environment can be fostered, shacks can be improved and basic services can be upgraded – all of which will vastly improve the living conditions of its inhabitants. 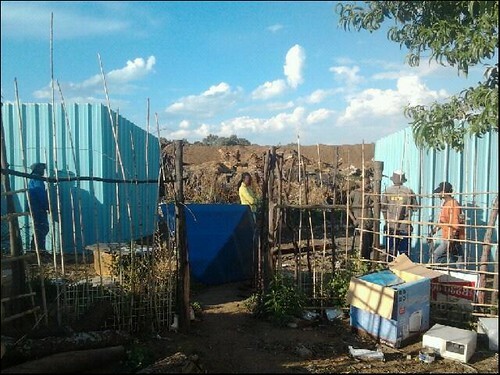 The SA SDI alliance name for reconfiguring an Informal Settlement’s layout is “blocking-out”. In order to start the blocking-out process, an organization called Ikhayalami raised funds for the upgrading of 40 shelters. It is envisaged that through community contributions and savings additional funds will be raised so as to complete the re-blocking of the entire settlement. In order to augment a community design process a partnership was created between the Ruimsig community and the University of Johannesburg architecture department. For seven weeks students and community ‘architects’ worked together to develop a new layout for the settlement. The local authorities from Region C of the Johannesburg Metro are in support of the blocking-out. General meetings have been held in the community with the local authorities demonstrating their support of the process. Demarcation of sites and building of shelters into a better-reconfigured layout began on 5th of October. The community is rallying behind the re-blocking process. Community savings and contributions towards the upgraded shelters is currently at R9 750 and growing hourly. The community is abuzz with activity and dynamism. Ruimsig is the second Informal Settlement to be blocked-out in South Africa. It is the intention of ISN, CORC and Ikhayalami for these two settlements to be precedent-setting, both for Informal Settlement communities and for the State.